Goodbye green. Another room gets painted. This summer has been so busy, but believe it or not, I’ve actually gotten a little bit of work done around this new (to me) house. I’m currently in that awkward phase where everything I do is so boring to blog about but necessary (aka painting every room). So, shall I just get on with it then and get to the before and after pictures? I think I shall. This time on the agenda is my daughter’s room. Let me jog your memory with a before photo. Try not to lose your lunch. Yup. Neon green. In semi-gloss I might add. 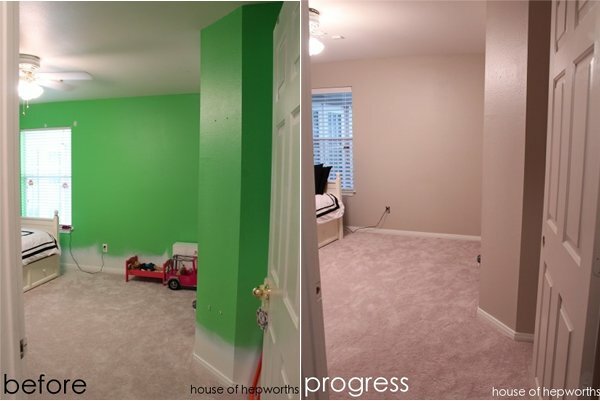 I’ll admit, all the white along the baseboards and the rectangles on the wall were my fault from when I painted the baseboards using a spray gun, but the green paint I refuse to take credit for. I am still kinda shocked we managed to live with the room in this condition for more than two months. There has to be a record somewhere for that. My poor daughter. This final before photo shows where I painted the bifold closet doors (that I ended up sticking in the attic anyway… doh!). It really ads a nice touch to the focal wall behind the bed. Are you dying to see the afters? Me too. My eyes are burning having to look at those before photos again. 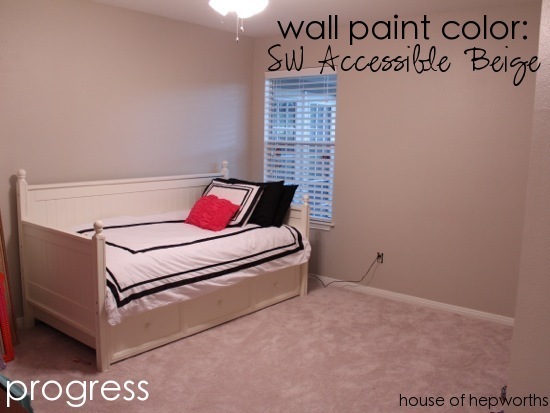 I went with Accessible Beige again from Sherwin Williams (in satin finish). I used it the first time in my son’s room. I also painted the ceiling in SW Alabaster (flat finish) and hung a brand spankin’ new set of blinds. I’ll round up the blinds info and give you the deets soon on those. I know it’s not the most crazy fun color ever, but after starting at these crazy colors for more than two months I just really need to get this house entirely neutral so my brain can even begin to process where to go from here. I have been overly stimulated and I feel like I need to live in a nice calm atmosphere for awhile. Also, call me boring betty but I just really love the look of nice crisp neutral walls as a base and then bring in accessories that are bright fun colors. And cry me a river, but my daughter is so over the pink. She is begging for purple. Time for a complete room overhaul I suppose (all the work I did on her accessories from her last room. Waaaaaa.) At least decorating and crafting is the fun part. 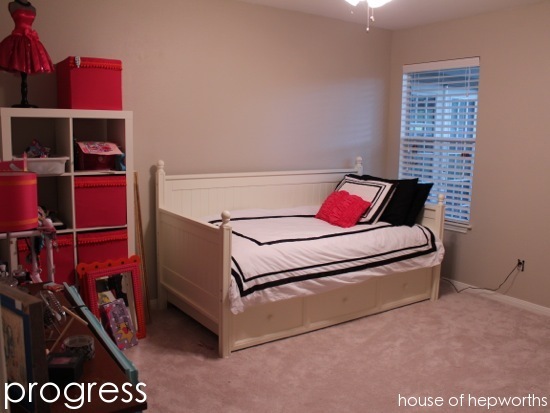 Her room is still about 99% undecorated. I at least have the bed made (give me some credit!). 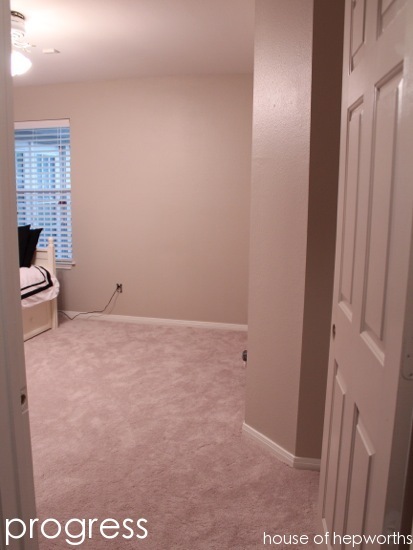 There are exactly zero items hanging on the wall and even the furniture placement is still negotiable. I did purchase a dresser recently that is sitting in my garage awaiting its makeover. And because nothing is more fun than a side-by-side before and after comparison, here ya go! Mind blowing, I know. 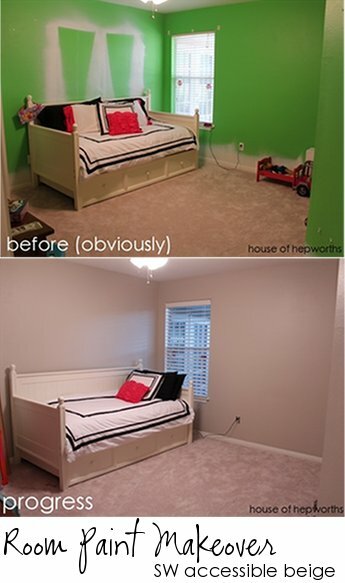 It does help that the before picture was so terrible. Going from white to beige would have been so boring. I should thank the previous owner for being so bold with their paint selections. It makes for a better reveal. And for all your pinterest junkies out there (raising my hand slowly), I whipped up this image with the paint color name on it in case you want to bookmark this color. No pressure but it’s there if you want it. Okay, so I have been working on the hall and the hubster’s office too. As soon as I can steal away a few computer minutes I’ll show you those areas as well. Hopefully (finger’s crossed) this Friday morning, but it seems whenever I promise to post on a certain day I almost always get thrown a curve ball, so no promises. Just high hopes. I used SW Accessible Beige for the first time in our old house (been renting it but will be putting on the market this week). I love how this color goes on light and then dries with a hint of gray. 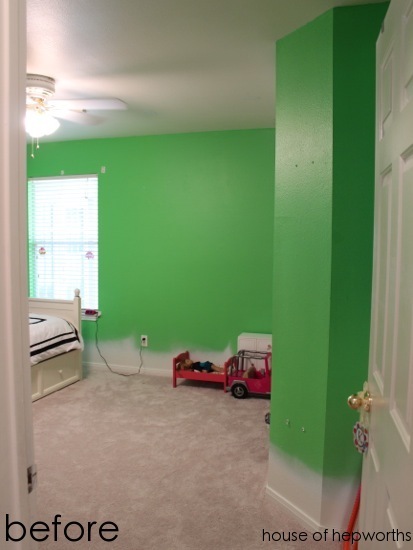 Thinking of painting my daughters room this color too! I can hardly wait until it’s decorated, it’s a nice blank canvas to work with. Way better. 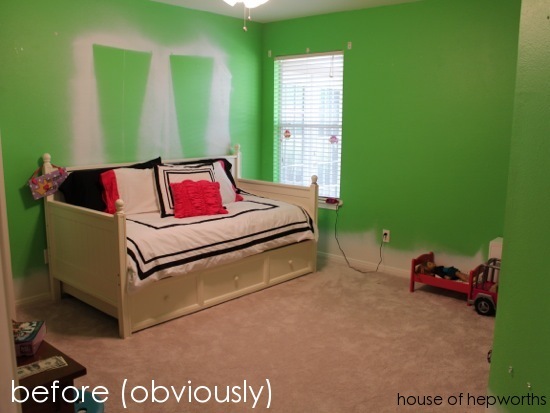 Although in pictures the “before” looks alarmingly like my daughter’s current room:) We are over pink here too, but I refuse to redecorate, the “baby” gets a new “big girl” room first, then I’ll redecorate already “done” rooms. Barely keeping my eyes open, Haven recovery is killing me!